So, it’s not surprising that the names Guy Stevens and Roger Eagle will mean nothing to 99.9% of DJs in this country, for these are what you might call the founding fathers of UK dance culture, one in the South and one in the North, sowing the seeds way back in the early ’60s – Guy Stevens (with James ‘Doctor Soul’ Hamilton, later Disco columnist for Record Mirror) at London’s legendary Mod haunt The Scene, and Roger Eagle, the resident DJ at Manchester’s original Twisted Wheel, on Brazennose St between 1963-1965 (the club then moved to its famous Whitworth St location, subsequently the birthplace of Northern Soul, where Eagle remained as DJ for the first year). Both were black music aficionados, fanatical about Rhythm & Blues and the earlier Blues pioneers, as well as Ska and Jazz (Eagle even publishing, for a short period, R&B Scene, one of the early black music magazines). The cultural importance of these 2 vinyl revolutionaries can’t be understated – they made a mammoth contribution to the emergence of Soul music as a major force in British clubs, and subsequently in the pop charts, and without them things would simply never have taken off in the way they did – these groundbreaking DJs were crucial to the process, and we owe them a great debt for everything that’s happened since, for it was they who set the wheels in motion. So, with this in mind, I’d implore anyone who’s interested in understanding the true roots of UK dance culture to read the new book ‘Sit Down! Listen To This! – The Roger Eagle Story’ by Bill Sykes. Eagle, who hailed from Oxford, arrived in Manchester on a motorbike in 1962 and, apart from a short period when he lived in Bristol in the early ’80s, would stay in the North until his death in 1999, aged 56 – his deep love of music affecting many many people along the way. Not content with carving a piece of Manchester history, Eagle would bridge the East Lancs divide, becoming the catalyst for a whole new Liverpool scene in the late ’70s, which stepped out of the shadows of The Beatles to cast its influences down the years, playing a seminal role in launching a new wave of artists including The Teardrop Explodes, Echo & The Bunnymen, Elvis Costello, Orchestral Manoeuvres In The Dark, Dead Or Alive and Frankie Goes To Hollywood. The hub for this upsurge of expression was Eric’s, a club, as with the Cavern before it (where The Beatles played so many times in the early ’60s), located on Mathew Street, which he ran in partnership with Ken Testi and Pete Fulwell. He was also key to the formation of Manchester’s Factory Records – having approached Granada TV host and Punk Rock ambassador, Tony Wilson, to become the head of A&R for a proposed Liverpool / Manchester label, to be called Eric’s Factory (Wilson then involved in a club night at Hulme’s Russell club called The Factory, the forerunner to The Haçienda), the 2 couldn’t agree on the format for the first release, the upshot being that Wilson would decide to start his own label instead, giving birth to the North’s most celebrated imprint. He went as far as to say that but for Eagle he might have been ‘just a TV presenter’. Other people who’d benefit from his influence during the Eric’s period, and his time promoting shows at the Liverpool Stadium in the earlier part of the decade, would include Geoff Davies (Probe Records), Jayne Casey (then in the Eagle managed band Big In Japan, later the co-founder of the Liverpool superclub, Cream), Ian Broudie (Big In Japan, The Lightening Seeds), Mick Hucknall (then in The Frantic Elevators, who Eagle managed for a time, later finding fame and fortune fronting Simply Red), Holly Johnson (Big In Japan, then later as frontman of Frankie Goes To Hollywood) and Bill Drummond (Big In Japan, then manager of The Teardrop Explodes / Echo & The Bunnymen, later founder member of The KLF). Sandwiched either side of his time in Liverpool, he’d book the acts for Manchester clubs Magic Village (which was at the heart of the city’s hippie / psychedelic scene of the late ’60s), and, from the mid-’80s – early ’90s, The International (and subsequently The International 2), which played a notable part in the whole Madchester era (The Stone Roses managed by International owner, Gareth Evans). I met him myself at The International, but I wasn’t aware of the full weight of his legacy at the time. Yet, despite being in the right place at the right time at so many different times and places, it’s only in more recent times that his hallowed position within British popular culture is finally being grasped. When Dave Haslam wrote his history of the Manchester music scene, ‘Manchester, England – The Story Of a Pop Cult City’ in 1999, Eagle gets just a couple of mentions, from his time at Magic Village and The International, but there’s nothing at all about those crucial years when he was at The Twisted Wheel, although Haslam does cover Eagle’s time at the Wheel in his subsequent book, ‘Adventures On The Wheels Of Steel – The Rise of the Superstar DJs’ (2001). 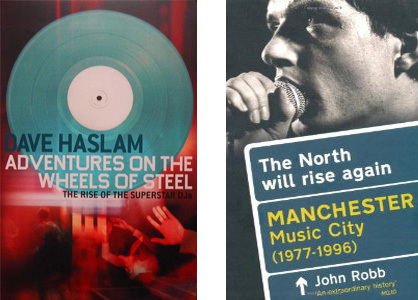 ‘The North Will Rise Again’ (2009), John Robb’s book about the Manchester music scene, the main thrust of which focuses on the period 1976-1996, brought Eagle’s legacy to the city into greater focus – presented as an oral history and covering the evolution of the now world-renowned Manc music and club culture, the opening chapter sets the scene in ’60s Manchester, with the first voice in this first chapter belonging to Eagle. Robb would go as far as to suggest that ‘without Roger Eagle there would be no Manchester music scene’. This is the gravity of the person we’re talking about. In a similar way to how, after years in obscurity, David Mancuso (whose Loft parties of the early ’70s lit the blue touch paper for the New York Disco era) was rediscovered and revered by a generation of club enthusiasts who, in many cases, weren’t even born at the time he was at the height of his influence, I’ve no doubt that, eventually, British pioneers like Roger Eagle, Guy Stevens and James Hamilton, who were way ahead of the curve, even with regards to what was happening in the US, will receive their proper dues, and be acknowledged within the DJ community as founding fathers of our rich clubbing tradition. If you’re a music lover, it’s safe to say that your life, in one way or another, has been affected by these pioneers. Their influence, albeit largely invisible, is unavoidable, and clearly audible in thousands of tunes that only found love in this country because of true vinyl visionaries like them. 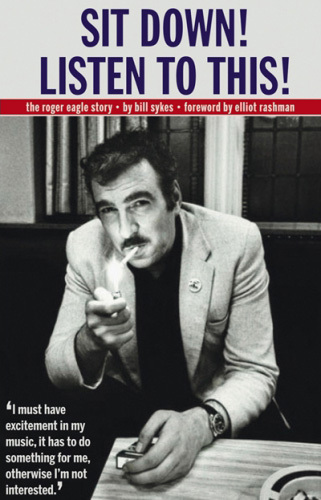 I went to the book’s Liverpool launch at The Picket, where the great and the good of the Eric’s era were out in force, celebrating the fact that, finally, Roger Eagle’s life has been documented in print, and his cult status greatly enhanced as a consequence. Bill Sykes spoke, of course, and number of people, including Geoff Davies, Jayne Casey, Pete Fulwell and Elliot Rashman (the manager of Simply Red, who as a teenager was a tripped-out Magic Village regular) shared some heartfelt anecdotes. It was clear that he’d affected them all profoundly. 23 Responses to Sit Down! Listen To This! With the blog, soundcloud, electrofunkroots, and all the time I have to put into the various aspects of my DJ career, there aren’t enough hours in the day. Writing Wiki entries is a step too far for me I’m afraid. Hope you enjoyed the piece sprout. Thanks Greg. As it happens I’ve just been reading up on the NY club scene in the 70s but to hear about something on my own doorstep is all the more interesting. I’ll be sure to check out the book. well said Greg. undoubtably an influence throughout the decades, from ther 60’s to now. 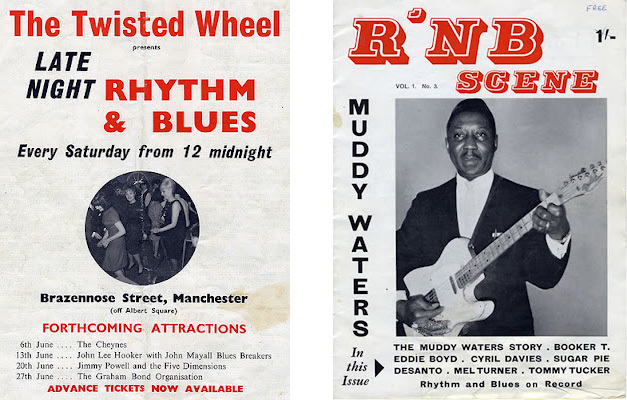 interesting what he had to say about The Twisted Wheel and the music he was getting asked to play by the time it had moved to Whitworth St…ie what became Northern Soul. As you say, there’s too little about Roger in my book ‘Manchester, England’, but in my defence, I cover 180 years of cultural and political history, and had to pick and choose a bit who to feature and who to make reference to without going deeper. ‘Adventures of the Wheels Steel’ came out in 2001. I think you should read it one day Greg!! You’ll see that once my focus narrows to DJs then I can do the great man justice. I travelled from Colwyn Bay to London town interviewing people about Roger Eagle and the information appears on pages 55, 109, 110, 111, 113, 114, 115, 116, 117, 118, 126, 127, 205. There’s far far more about Roger than about Mancuso!! It’s mostly about the Twisted Wheel and, interestingly, how he became disenchanted with Northern Soul and the Wheel (people don’t mnake enough of that, how he left the Northern Soul scene behind, fed up of the drugs and the narrow music choices). And there’s a whole chapter on Guy Stevens. His links with Roger were documented for the first time, as well as the bigger picture of what Guy Stevens did and what he achieved. Oh, and my ‘Not Abba’, have you read that??? Came out in 2005, Roger is all over pages 77, 78, 222, 246, 275, 313. Mostly about Erics. There, made your life easy, you don’t have to read the whole of these books, just flick through. So the story wasn’t untold until whenever. At least some of it was out there (did my best. can’t force people to read these books though I guess). Looking forward to this new Bill Sykes book though, of course, the whole story is intriguing (especially his connection with Tony Wilson). I hope there’s stuff about his years at the Stadium too. In the meantime Greg, if you want to catch up on my writing, just ask, I’ll send you the books, no problem. Sometimes i think I should blog, people don’t flippin’ read books. Oh well. Hi Dave, I never got around to reading ‘Adventures On The Wheels Of Steel’, completely missed it at the time (I was well out of the loop in 2001, a few more years before I started deejaying again) but I’d be more than happy to take you up on your offer (also the ‘Not Abba’ book). Would be good to read, especially with regards to Roger Eagle and Guy Stevens. Anyhow, I’ve amended accordingly – I was just trying to point out that Eagle’s place in Manchester music history has been largely obscured – as I mentioned in the piece, when I met him at The International in the late 80’s, I personally had no idea of his full legacy (being from Merseyside, I knew he’d been involved with Eric’s, but not that he was right at the roots of the Manchester’s club culture, being the DJ at the original Twisted Wheel and setting the tone for all that followed, not least the Northern Soul movement). Were you not aware of his time at the Wheel when you wrote ‘Manchester, England’? I figure that this must have been the case as you’d surely have covered it otherwise. Yeah, his time promoting at the Stadium is well covered in the book, and the stuff with Tony Wilson is fascinating. I’ve had Adventures on the Wheels of Steel for a few years and not read it yet. This is a reminder that I must. Books all the way for me Dave! The internet is a fantastic resource and I read a lot of blogs etc’, but taking a laptop to a remote beach and getting an internet connection is sometims difficult (though not always impossible). Not sure about Kindles either. Anyroad, walking past Beat N Rhythm on Tib St this morning at 8am, I noticed a book in the window called Central 1179 which is about the Twisted Wheel – has anyone read it? Also, are there any recommended books about the NY dance scene in the 70s? The Twisted Wheel book is very thorough, with lots of photos and dates of who played and playlists etc. In terms on NYC, there’s an amazing book called ‘Night Dancin’ by Vita Miezitis which was published in 1980 more a guidebook than a history book, so it is full of stuff about the clubs that were then open, inc Paradise Garage, Crisco Disco, Le Clique, Leviticus, Mudd Club, Studio 54, Hurrah’s etc, with sections of gay clubs and also roller discos! Photos of the clientele and tells how much the drinks cost too. BUT expect to pay £30 for a 2ndhand copy at least. “Over the years I’ve read very many articles & books on the 70’s disco & underground dance scene, along with seeing quite a few documentaries & movies in the same vain. I started DJing in NYC in 1971 & this is a subject that I lived & breathed. & accurately chronicle that entire decade year by year. I found it easy to read, & without blurring the facts, very entertaining. Thanks very much for the recommendations, I appreciate it. Still on the subject of New York and disco (I know this wasn’t the original premise of the thread), but can anyone recommend any clubs in New York? I am there from the 13-18 Dec, first time, and want to sample one night out. I’ve looked online but not sure. I’d suggest you go to Brooklyn whilst you’re there, that’s where most of the best parties are these days (although you should also make a point of checking out Deep Space @ Cielo, in the Meatpacking District every Monday night). If you email me closer to the time I’ll find out what’s happening when you’re over. Almost forgot, Central1179 is a proper obsessives book, there’s a lot of heart in there, a real love of the subject matter. If you’re interested in the Twisted Wheel and Mod culture, in its closer detail, it’s an absolute must. That’s great, thanks a lot Greg I appreciate it. Just to say that Dave was as good as his word and he sent me a copy of ‘Adventures On The Wheels Of Steel’, which I’ve now read – and a very enjoyable read it was. It’s a really good snapshot of a moment in time, the club scene entering the millennium, with some historic detail included for perspective. I like the fact that it isn’t a definitive account, so it’s able to jump around a bit without leaving gaping holes in its wake. It’s really well observed and I like the fact Dave documents the actual appearances, giving a taste of what was happening on the nights he met up with the various DJ’s he interviewed, warts and all. Given the nature of ‘Wheels Of Steel’ it doesn’t matter what was left out – it wasn’t that type of book. As well as the ‘big name’ DJ’s, it also covers some of the lesser-known, to give a really good overview of the fuller DJ spectrum. What also struck me is that 2001, the year it was published, now seems a long time ago, which it was – over a decade. I still tend to think of anything in the 2000’s as pretty much yesterday, but, of course, it isn’t. A Roger Eagle Mix Tape from the mid to late 80’s called ‘The Barefoot Rock’. Incredible stuff! & just what I needed. Nice to see that Roger is getting some recognition. I wrote quite a lot about Roger and the Dance scene at the ‘Wheel’ in my book THE MANCHESTER WHEELERS. Hardly anyone knows that after leaving the Wheel Roger DJayed for six months at Manchester’s BLUE NOTE Club; taking his record collection there (causing problems for the Wheel!). He introduced many Stax tracks at this club giving it the reputation of the best black music location in the city, before he opened his own club called STAXX! I followed him as DJ at the Blue Note. Many years later I sold him a vacuum cleaner at Eric’s club in Liverpool!